I finished the mermaid manuscript in the beginning of April. I took up something else, but it never set me on fire. I found myself reading old manuscripts to see if anything sparked, and this one did. To make up for my long absence (sorry again) here’s an excerpt from the story. A few things to know about the world: it’s a steampunk setting, influenced by English society in the 1890s. There’s some technology but it’s not available to everyone. Like English society there are class levels. Andra works in a Manor House as a servant. While she has the ability to purify anything, from a ghost to a cup of water, with just the touch of her hand, she’s a servant and fairly low in the social structure. Still, she’s above Chatham, a bar owner from the very rough town the Manor House overlooks. This piece is their first meeting, written two years ago, and the thing that sparked my interest enough to start me writing on it again. Ginger slid up to the bar with a grin on her face, like a cat that found a mouse to play with. Chatham expected she’d found a willing man for the night. Chatham’s hand was already opening the piece of the bar, stepping outside it. Not this, not in his bar. Behind him Ginger laughed but Matthew just shook his head. He found the girl in a back booth, her body pressed up against the wall, her eyes wide. She sat wrong, with one arm pressed into the wood of the booth and the other on the table. Sure, it was safer, but that’s not how people sat in a booth. The wrongness of it stopped him for a moment, but then he noticed her arms. Slim, delicate wrists, soft looking light tan skin going up to the curl of her elbow, his eyes dragged themselves away from that female flesh and back to her face. “Can I help you?” He demanded. Ginger might let her dress slip from her shoulders, and a few girls wore outgrown dresses that showed an inch or two of wrist, but this woman, her arms were bare from elbow to fingertip. Even a pair of gloves wouldn’t hide all that flesh. It should have been shameful, but Chatham found it tantalizing. It made him mad. “I… I was… that is, I hoped I could help you,” the girl stammered. He put her at fifteen, maybe sixteen. Though she could be twenty and passing for younger to help with her con. He finished laughing and snorted at the thought, no one in Downriver could afford purified water. They all used cleansed water. It tasted like chemicals but no one got sick or died from it. She took a minute trying to get out of the booth, finally turning so her face was toward him but the rest of her toward the front. It was an awkward way to sit, and she wished she’d felt secure enough to put her back to the bar. She hurried to catch up with the bartender, his red vest a spot of bright color in the bar. The other patrons wore browns, dirty whites, and the occasional blacks, blended together somehow in a uniform color she would call worn-out or washed out. The women even looked that way, their dressed faded to pale yellows, dusty blues, and watery pinks. Andra kept her eyes on the man, his dark brown hair and lanky frame just a head of her until he opened a back door of the bar and disappeared. Two steps outside she found him again, standing just beside the opened door. The light from the bar fell on a concave gutter. It ran down the alleyway with a rapid current, two feet wide and deep. Litter swirled as it moved past. A dead rat collided with the side of a broken jar then eventually moved farther down, into the darkness. “I am a Purity,” Andra insisted. “You want me to Purify, this?” She pointed to the gutter water and squatted beside it. Closer to it, she saw it wasn’t so deep, maybe two feet, maybe one. “I want you to stay out my bar.” She heard the hate in his voice before she felt his boot on her back. It wasn’t a kick, just a shove. She lost her balance immediately, and went head deep into the water. She wanted to shout but stopped herself, clamping her mouth shut against the filthy water even as rage boiled up inside her. She heard the door to the bar slam closed as she put one arm in the water and propped herself up. Her hair had gotten the worst of it. Her shirt was wet but thankfully not soaking. Her skirt just splashed, but filthy with grime where it’d hit the street. How dare he! She offered a reasonable business agreement and he treated her like a criminal. The door behind her opened quietly, and the red haired girl stepped out, a glass in her hand. Andra thought for a second it was a peace offering, but no. The girl tipped the glass out, adding half a pint of beer to the mess of Andra’s hair. Pushed beyond her limits, Andra’s hand shot out and grabbed the girl tightly by the wrist. “Gladly.” Her other hand took the pint glass, then she dropped the girl’s hand. She reached and filled it with the toxic mess, catching some of the grit at the bottom. She pushed the girl aside and stormed back into the bar. Every eye was on her, every conversation stopped, but Andra didn’t stop to notice it. She kept her eyes locked on the target of her hate. “You!” She slammed the glass of black-colored water down on the bar. He opened his mouth to protest, but she spoke before he got a word out. “Watch!” She put her fingers into the glass and let the purifying begin. The process ended almost as soon as it started. She was used to gallons, not pints, to high cisterns and vats of soup, not one beer glass. Still, a collective gasp went up from the bar as the water swirled around her fingers. She moved them in a circle, creating a current to catch the flakes of chemicals and sediment. In the center of that swirl the sediment looked first dark black, darker than the rest of the water, and then white, as more and more of the foreign matter got trapped the swirl became bright white, and the rest of the water clean. “I am not a charlatan. You owe me an apology.” She drew herself up as high as her slight frame would allow. Andra didn’t bother to roll her eyes, she grabbed the glass and put it to her lips, draining it until the last inch. When she saw the white sludge at the bottom coming toward her she dropped it back to the bar. The room exploded in cheers. “I’m sorry,” the bar man mouthed over the sound. “I need a room and work to pay for it.” She shouted to make herself heard. “Like they can afford it.” Ginger’s sarcasm cut through the triumphant atmosphere. Andra felt the mood of the crowd shift. What comes first, the book or the bookmark? Poor Linda is struggling with crafts, while I’m worrying over contract issues. Judging by the blogs, internet articles, and comments on social media, these aren’t the only concerns on writers’ minds. What happened to the days when all we had to do was write, and write well? When did becoming a writer turn into becoming a marketing expert, attorney, public relations specialists, graphic artist, and a manufacturer of promotional materials? Ernest Hemingway is one of my literary heroes. I toured his home at least three dozen times as child. I (briefly) owned a descendant of his cat, a wonderfully fat polydactyl tom. I admired his pool, and the last penny he embedded in the tile as a jab at his wife. I shivered at the sight of his wine locks, amazed that a man so famous could have to be so careful. In all those tours I never saw the spot where he made bookmarks. I remember his office with tall windows letting in sunlight, animal heads glaring down, and an antique typewriter, but not a single filling cabinet of promotional materials. None of the bookmarks Linda is struggling with or the pens, pencils, notepads and other ‘giveaways’ I hear about at writing conferences. Two years back I heard a well published author speak about her giveaways: post it notepads. She went on about giving them to people in the line at the grocery store, to her friends, leaving them in libraries. A good author, she proclaimed, is always marketing. What about writing? Shouldn’t it come first, last, and in the middle too? When it comes to balancing the business part of writing with the creative part I don’t have a good answer. I’m not sure if we should be promoting with 10% of our author time, or 50%. Every minute I spend not writing seems like ten minutes I’ve actually lost. For me, for now, I’d much rather worry about plot points and characters than bookmarks and sub-clauses. 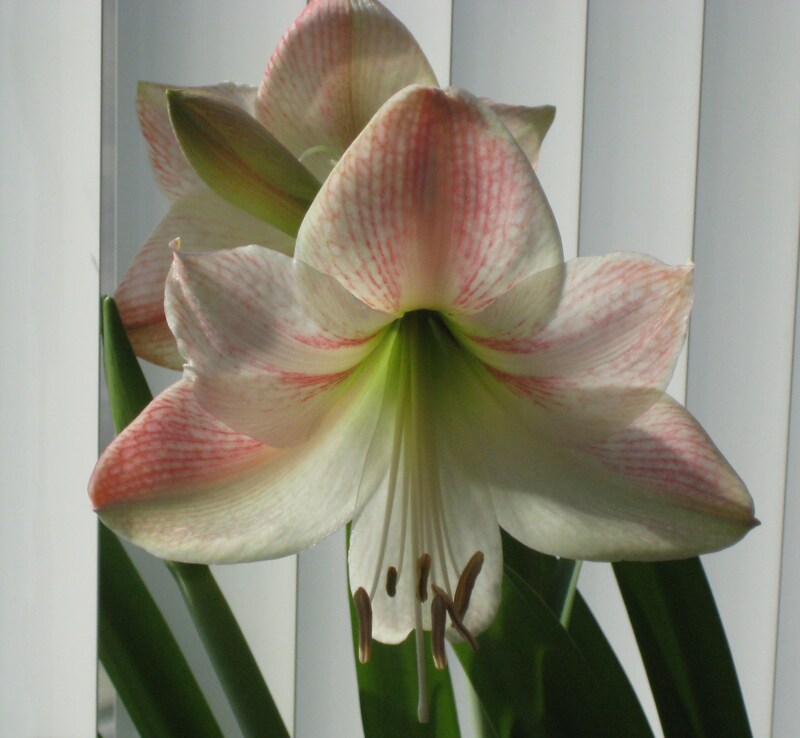 Each Christmas a dear friend gives me an Amaryllis in bloom. The flower dies in six weeks or so, but the long green leaves decorate my windowsill until the fall. Then, in an act of great faith, I cut off all the leaves, shake the bulb out of its nest of dirt, and throw it into the fridge. It waits there for me, for at least a month, until I put it back where I found it. Then I wait for another eight weeks, hoping that the magic will still work. If I’m lucky, I get the photo above. If I’m very lucky, I get better: more flowers, more bulbs. It’s a lot of waiting and lot of hoping. It’s taking drastic steps, damaging something that I know is working because I believe I can get better. I value the final flower enough to risk killing the plant. I don’t even pretend to know how bulbs form in the wild, how they work when there is no refrigerator. I take it on faith that the people who guide me know what they’re doing. I’m editing now – somewhere between my second and fifth formal round of edits, depending on how you count. My time was not my own this fall, and so my Amaryllis bloomed late, in January instead of December. They sit on the window by my desk, and reassure me that my edits, which require just as much faith, will turn out. I hope they’re right.